So Maybelline have lips covered for the rest of the year I tell you. Last week I told you about the new Color Elixirs that will be on counters in September and I have been obsessed with them since they arrived. I wore Mandarine Rapture to my cousin's wedding last weekend and during the week have been getting to grips with Blush Essence and it's love. Now they've only gone and added to my lip wardrobe (it's a thing) and come September 1st, they're releasing the Color Drama Intense Velvet Lip Pencils. The name pretty much gives the game away, but I'll explain it just in case. We're talking intense pigmentation, so not for the faint hearted, we're talking semi matte finish and we're talking comfort on the lips. We're talking about a lot of things really. I got sent four of the ten available shades to play with and first impressions are really good people. Really good for my lips, really bad for my spending ban because I want more shades, more I tell you! But on to the ones I have today. Having lip products in pencil form makes me happy. It means you can enjoy precise application, well, until it starts to go blunt and then you're probably going to need a lip brush to be precise at your lip lines, but hey, that's ok. In terms of formula, they're all creamy, super pigmented and really easy to work with. Now, while these are way too intense and pigmented for me to wear to work as I'm a big scaredy cat when it comes to wearing anything other than neutrals during the day, for night time, this autumn I'm sorted for any nights out. Factoid. My initial thoughts are that they feel really comfortable on my lips and haven't dried them out yet, but further testing is needed. In With Coral is the perfect summer lip colour and I don't care what happens, I'm going to a sunny place next year on holidays and will bring this with me, or if we get a September heat wave, I'm sorted. It's almost neon but still manages to be wearable. I want to wear this with thick black liner so I do. Fuchsia Desire was the surprise of the four in that I don't usually gravitate towards pinks because they don't usually suit my skin tone but I think the purple undertones in this shade works with the green in my eyes and I feel very ladylike altogether when I wear this. For those who love darker lips, then Berry Much hits the nail on the head and while it looks almost brown in the photo below, it's definitely on the berry/purple end of the scale. I haven't tested out the longevity yet and of course, there are going to be comparisons to the Nars, so stay tuned for a blog post on that very soon. Either way, first impressions are telling me that I'd happily shell out the mere €6.49 that these will be come September 1st and I will! Are you excited about this launch folks? Which is your favourite so far? Most of the things you present on the blog I like but am too ruined (lol) to buy, but with this price I'm sure I can play too :D Plus pencil things are my favorite way to go lip-wise. Do you know if all the shades will be as bright as these ones ? I love the look of berry much! 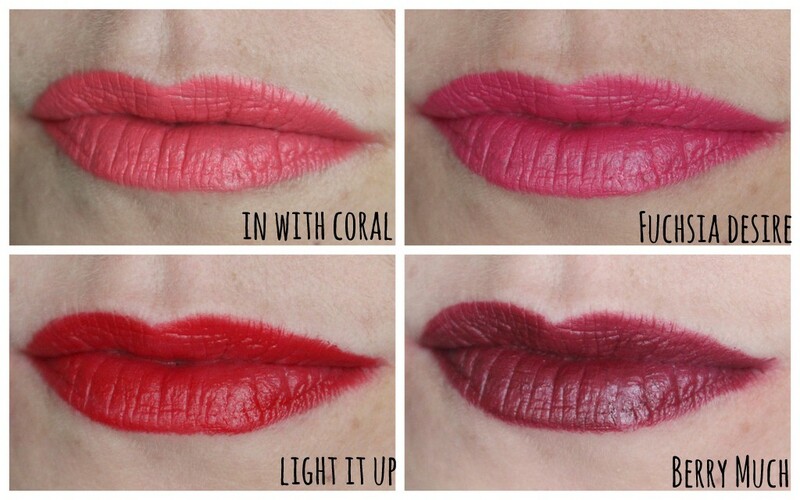 I love the look of the Coral and Fushia ones - I can't wait till they are launched and can try them out!